Don’t forget to stop by these pages to enter my 3 current giveaways! I have one for a Perfect Portions Digital Food Scale, another for a Butterball Thanksgiving Turkey, and one for tickets to our local Orlando Food and Wine Festival. I also have several other big giveaways scheduled before Christmas that I can’t wait to share with you. I love to enjoy sweet potatoes in this creamy and comforting soup. It’s a perfect recipe for fall. It’s so simple, and has just 6 ingredients. Add all chopped vegetables to a large soup pot. Add poultry seasoning. Add stock. Add just enough water until all vegetables are just covered. You may have to add a little more water to cover the vegetables. Boil until vegetables are very tender. 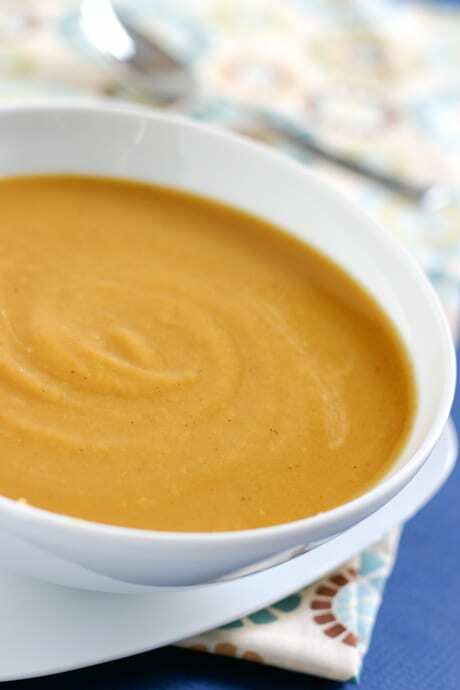 Use a submersible blender to puree the soup, or you can also add the vegetables and stock to a blender and puree in batches. Add milk or cream and heat through. We made sweet potato soup over the weekend, and it was so very good! However, ours wasn’t nearly as creamy as yours…which I think I’m going to try next time. I imagine that this was heavenly to spoon into your mouth.